When people are walking in the rain forests of Xishuangbanna, they must be extremely careful, because if they don�t take care, they may bump on the most poisonous plant of the world, the upas, thus may incur disaster for themselves. The milk white liquid of upas contents toxic substances. As soon as it touches the wounds of people and animals, it can make the poisoned paralytic in heart, their blood veins close, their blood congeal or even choke them to death; so it gets its another name "killer at blood". There is a proverb in Xishuangbanna to describe the toxicities of the tree and it goes: "up 7, down 8, and fall down at 9". It means that, no matter who is poisoned, he can only walk 7 steps upward, or 8 steps downward, and he would fall down and die away in the 9th step. It sounds really terrible and it makes the people turn pale at the mentioning of it! In the past, the liquid of upas was used in battles or hunting. The local folks would mix the poisonous liquid with other supplementary materials, braise the mixture into thick poisonous liquid, and then smear it on the arrowheads. Once a wild animal was shot by such arrows, it would die immediately; but the meat of the animal had no poisons and was still eligible. It is said that when the ancient Indians in America went to battle, their women and children would smear the poisonous mixture on the arrowheads and sent them to the fronts for men to kill the enemies. In this way, the Indians always won; the enemies left their corpses on the battlefields, and the Indians kept their homes intact. According to the records in the history, in 1859, when the natives of the East Isles fought with the British troops, they shot the poisoned arrows to the invaders. At the very beginning, the British soldiers did not know the fearfulness of the arrow, and their wounded soldiers continued to forge ahead, but they soon fell down and died. The poisoned arrows aroused terrors among the British soldiers. It�s said that the person who found the upas had poison for the first time was a Dai hunter. Once, the hunter was forced to climb on a tree by a big bear, but the bear continued to run after him, in this drastic moment, the hunter broke a branch from the upas tree, and stabbed it into the bear that was climbing the tree. Then, a miracle happened, the bear fell down and died. Ever since then, the hunters of Xishuangbanna learned to smear the poison on their arrowheads. In spite that the upas tree is so terrible, it has a lovable aspect: since its barks are thick and rich in tensile textures, the minorities in Xishuangbanna often use them to make pads, clothing or skirts. They would choose a section of barks suit to their body, cut down the tree, and knock on the bark with a small wooden stick evenly within a suitable length; when the bark separates with the wood, they would pick up the bark, cut it open with knives; then saturate the bark into the water for about a month, then clean and knock it beside a ponds to get rid of liquid and poison. After they get rid of the poisonous liquid and the glue, they would get white, thick and soft fiber textures, which can make clothes or things like. They would make it into pads, which is comfortable and endurable. The pad would not lose its flexibility even in dozens of years. The clothing and skirts made out of it is light and warm and are loved by the local folks. 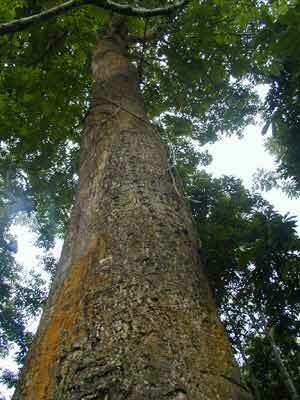 Upas is a sort of evergreen arbor and it can grow as high as 30 meters. The base of the trunk is thick, and the bark is gray. The tree abloom in Spring and it mainly scatters in the tropical areas near the equator, and can be seen in Canton, Guangxi, Hainan and Yunnan etc. in China. It is now specie in danger and a Class III protection plant of China.